Ice cream used to be my true love. We spent many long, summer nights together, sat through sappy movies, consoled girlfriends over broken hearts. Our breakup was difficult: I could no longer tolerate his sweetness, or cow-dairy origin and quite frankly, he made me sick. Yes, it’s been a rough few years, but recently I met someone new that is just as satisfying, creamy and sweet as his dairy counterpart, except that he is actually good for me! Too good to be true? Well, let me introduce you to my new soul mate: the modest and down-to-earth banana. This past winter, steeped in perpetual boredom, I took a couple frozen bananas out of the freezer to bake a loaf of banana bread. While they were thawing, I became impatient and decided to speed up the process by mixing them up with a hand blender. Lo and behold, this simple process yielded a fluffy, creamy dessert that almost brought me to tears: I never thought I could replace my beloved ice cream, but I did. This is truly the easiest (and cheapest) dessert to make, especially for a crowd. You can buy a bunch of bananas well in advance and freeze them once they become very ripe, or you can buy them on sale towards the end of their little lives. You can blend in some honey, maple syrup, agave nectar for added sweetness (although it really doesn’t need any if the bananas are really ripe), or add your favorite toppings. 5. Using a hand blender (unfortunately this does not work in a counter top blender) pulse through banana chunks until a smooth, creamy consistency is reached. It will look almost white, like real ice cream. Tip: Once blended, this can be frozen again for serving later, but ice crystals tend to form very quickly as there are no additives to prevent this from happening. Giving the mixture a quick blend again right before serving will ensure the creamiest texture. If you run the frozen bananas through a Champion juicer you have instant perfect “ice cream” Thanks so much !!! I love any and all banana recipes!!! Thanks so much Sarah! Made this little beauty myself, so quickly and cheaply!! great with some cinnamon, almond butter and pure vanilla extract added in! First, I really love this blog. Thank you so much for helping and inspiring so many people. I have a quick question. I have recently made a banana like ice cream. I took coconut milk and frozen bananas and made a creamed smoothie like item. put it in the freezer for about a half hour and then it was a nice ice cream consistency. I had left overs and put it back in the freezer, and now it is a rock hard item. I wanted to know if you had any suggestions on how to make the consistency smooth like ice cream again, rather that a frozen pop. thanks. I LOVE banana ice cream. So flipping creamy! Hello, I love love love this ice cream! I make mine in the food processor…even easier still. My girls beg for banana ice cream, and it’s a rare day I say no. In fact, I never do! They especially like it with shaved organic, fair trade, dark chocolate chips. Yum. I’ll have to try with coconut next…or maybe melt some chocolate chips and mix with honey for syrup…mmm! I had three of your recipes lined up today- the hazelnut butter, banana ice cream and those delicious crepes! I was just getting done with the hazelnut butter and onto the banana ice cream when I just thought to myself, maybe I’ll just throw in this frozen banana without cleaning the blender first. Frozen banana with that hint of leftover hazelnut butter- HEAVEN! And I used this ‘spread’ to fill my crepes– sooooo delicious! hello sarah, just discovered your blog and really enjoying it. 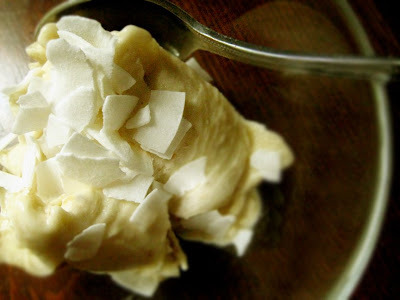 a good friend of mine used to make this banana ‘ice cream’ sometimes, but we would add some almond butter when blending, then refreeze. So so so good and nutritious too!